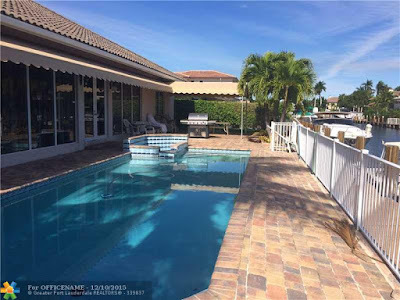 Broward Real Estate: Waterfront Home In Lighthouse Point, Florida For Sale! Waterfront Home In Lighthouse Point, Florida For Sale! This charming waterfront home in Venetian Isles community of the sought after Lighthouse Point is impressive! The three bedroom and three bathroom home is laid out on about three thousand square feet of perfectly appointed living space. This is a boaters dream with only a few moments drive to the Hillsboro Inlet and eighty five feet of ocean access water frontage. The bright and airy open floor plan allows for most of the rooms to have a beautiful view of the sparkling swimming pool and water! The patio is over sized and is paved in brick. This backyard oasis is perfect for entertaining! all the doors and windows are high impact. This home was built not to long ago in 2003. The soaring ceilings make this home feel even larger! 4200 North East 23rd Avenue is located in Lighthouse Point and is currently asking $1,050,000.00. Residents of Venetian Isles are in close proximity to world class shopping, dining, and entertainment at nearby Mizner park and Shops of Town Center. The fort Lauderdale International and Palm Beach International airports are close by for ease of traveling from home to home!